Reading Passage 115 has six sections, A-F. Choose the correct heading for sections B, C, E and F from the list of headings below. Write the correct number, i-xi, in boxes 27-30 on your answer sheet. The disappointing results of many conventional road transport projects in Africa led some experts to rethink the strategy by which rural transport problems were to be tackled at the beginning of the .1980s. A request for help in improving the availability of transport within the remote Makete District of south­western Tanzania presented the opportunity to try a new approach. The concept of’ integrated rural transport was adopted in the task of examining the transport needs of the rural households m the district The objective was to reduce the time and effort needed to obtain access to essential goods and services -through an improved rural transport system. The underlying assumption was that the time saved would be used instead for activities that would improve the social and economic development of the communities. 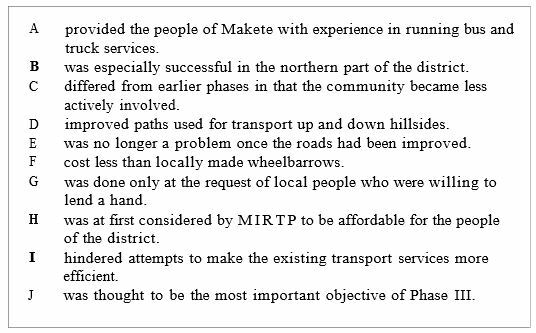 The Makete Integrated Rural Transport -Project (MIRT P) started in 1985 with financial support from the Swiss Development Corporation and was coordinated .with the help of the Tanzanian government. When the project began. Makete District was virtually totally isolated dunng the rainy "sensory. The regional road was in such bad shape that access to the main towns was impossible for about three months of the year. Road traffic was extremely rare with the district, and alternative means of transport were restricted to donkeys in the north of the distinct people relied primarily on the paths, which were supper and dangerous during the rains. An improvement of the rotted network was considered necessary to ensure the import and export of goods to the distinct These improvements were carried out using methods that were heavily dependent on labour. In addition to the improvement of roads, these methods provided training in the operation of a mechanical workshop and bus and truck services Hoverer. the difference from the conventional approach was that this time consideration was given to local transport needs outside the road network. Most goods were transported along the paths that provide short-cuts up and down the hillsides, but the paths were a real safety ask and made the journey on foot even more arduous. It made sense to improve the paths by building steps, handrails and footbridges. It was uncommon to fixit means of transport that were more efficient than walking but less technologically advanced than motor vehicles. The use of bicycles was constrained by their high cost and the lack of available spare parts. Oxen were not used at all but donkeys were used by a few households in the northern part of the district MIRTP focused on what would be most appropriate for the inhabitants of Makete in terms of what was available, how much they could afford and what they are willing to accept After careful consideration, the project chose the promotion of donkeys - a donkey costs less than a bicycle - and the introduction of a locally manufacturability wheelbarrow. At the end of Phase II, it was dear that the selected approaches to Makete's transport problems had had different degrees of success. Phase III. from March 1991 to March 1993, focused on the refinement and must of these activities. . The road improvements and accompanying maintenance system had helped make the district centre accessible throughout the year. Essential goods from outside the district had become more readily available at the market and prices did not fluctuate as much as they had done before. Paths and secondary roads were improved only at the request of communist who were willing to participate in construction and maintenance. However, the improved paths impressed the inhabitants, and requests for assistance greatly increased soon after only a few improvements had been completed. The efforts to improve the efficiency of the existing transport services were not very successful because most of the motorised vehicles in the district broke down and there were no resources to repair, them. Even the introduction of low-cost means of transport was difficult because of the general poverty of the district The locally manufactured wheelbarrows were still too expensive for all but a few of the households. Modifications to the original design by local carpenters cut- production time and costs. Other local carpenters have been trained in the new design So that they can respond to requests. Nevertheless, a locally produced wooden wheelbarrow which costs around 500QTanzanian shillings (less than US$20) in Makete, and is about one quarter the cost of a metal wheelbarrow, is still too expensive for most people. Donkeys, which were imported to the district have become more common and contribute, in particular, to the transportation of crops and goods to market Those who have bought donkeys are mainly from richer households but with an increased supply through local breeding, donkeys should become more affordable. Meanwhile, local initiatives are promoting the renting out of the existing donkeys. It should be noted, however, that a donkey, which at 20,000 Tanzanian shillings costs less than a bicycle, is still an investment equal to an average household's income over half a year. This dearly illustrates the need for supplementary measures if one wants to assist the rural poor. It would have been easy to criticize the MIRTP for using in the early phases atop-down' approach, in which decisions were made by experts and officials before being handed down to communities, but it was necessary to start the process from the level of the governmental authorities of the district It would have been, difficult to respond to the requests of villagers and other rural inhabitants without the support and understanding of district authorities. Today, nobody in the district argues about, the importance of improved paths and inexpensive means of transport But this is the result of dedicated work over a long penned particularly from the officers in charge of community development They played an essential role in raising awareness and interest among the rural communities. The concept of integrated rural transport is now well established in Tanzania, where a major program of rural transport is just about to start The experiences from Makete will help in this initiative, and Makete Distinct will act as a reference for future work. Do the following statements agree with the claims of the writer in reading passage 115? 31 MIRTP was divided into five phases. 32 Prior to the start of the MIRTP the Makete district was almost inaccessible during the rainy reason. 33 Phase I of MIRTP consisted of a survey of household expenditure on transport. 34 The survey concluded that one-fifth or 20% of the household transport requirement as outside the local area. 35 MIRTP hopes to improve the movements of goods from Makete district to the country's capital. Complete each sentence with the correct ending, A-J,below. Write thecorrect letter, A-J,in boxes 36-39 on your answer sheet. Choose the correct letter.A, B, C or D.
Which of the following phrases best describes the main aim of Reading Passage 107?